INDIANAPOLIS -- The School of Engineering and Technology at IUPUI announced that the National Institutes of Health has awarded a four-year R01 grant of $1.5 million to Chien-Chi Lin, Ph.D., Associate Professor of Biomedical Engineering. 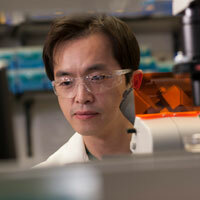 Lin's research is focused on pancreatic cancer. With a dismal five-year survival rate of 8 percent, pancreatic cancer is projected to become the second leading cause of all cancer-related deaths by 2030. While treatments have been identified, challenges remain due to exceptionally dense tissue found with this type of cancer. Lin's project, "BRAVE Hydrogels for Interrogating Cell-Matrix Interactions in Pancreatic Desmoplasia," strives for a deeper understanding of tumor-tissue interactions using hydrogels with precisely engineered properties. His research will help identify targeted medicines to block the growth and spread of the cancer by interfering with molecules that help the disease's progression. "This grant comes at a great time to propel my research to the next level. I couldn't be more excited about it," said Lin. Lin is using hydrogels to study pancreatic cancer cells, including how they multiply, move and spread. To create artificial tumor tissue, he uses gelatin, the major solid component in Jell-O, and hyaluronic acid, a critical component found in normal and tumor tissue. These materials are precisely engineered to present appropriate tissue-like properties that can mimic the timeline of tumor cell development. Eventually, these hydrogels could be used to test medicines to see if they work before testing with patients. To mimic gradually stiffened tumor tissue, Lin uses several unique chemistries to provide precise control in the timing, location and extent of stiffening. The hydrogels can be used to study the molecular mechanisms that govern the progression of pancreatic cancer cells and other tumor-associated cells. The results of Lin's research will provide insights into cancer cell invasion and migration as well as potential molecular targets against metastasis. The mission of the School of Engineering and Technology at IUPUI is to be one of the best urban university leaders in the disciplines of engineering and technology recognized locally, nationally and internationally. The school's goal is to provide students an education that will give them the leverage to be leaders in their communities, industry and society.